In the email accompanying his image, Pavel writes that the area is rarely imaged. And you can see why, there is nothing of interest, right? At first blush that comment seems justified, but every spot on the Moon has a history, including many chapters we can read, and others we just see but don't quite understand. This is an area deep in the southern highlands, with old surfaces and many craters, unrelieved by a dramatic newer one. But the surfaces here are interesting. Note how much the area from Nicolai to Wöhler is peppered with small pits. But very abruptly, between Riccius D and E, that surface is bounded by one that has far fewer craters and appears brighter simply because it has fewer shadows cast by small pits. Jump down to Nicolai P and see that its floor is a smooth-surfaced lagoon within the highly pitted area. These smoother surfaces must be younger, for the accumulation of small craters is unrelenting, unless they are covered. So what is the covering? We are just a few hundred kilometers south of the rim of the Nectaris Basin, so basin ejecta is a possibility. But I have a hard time understanding how ballistic delivery of very fluid ejecta would produce sharp boundaries as between D and E, or how the ejecta would just fill some crater floors (P) and not areas surrounding them. Interestingly, a broad area south of Nicolai has fewer craters like the smooth surfaces here, but there is no apparent reason why. Is it a larger regions of fluidized ejecta, or of volcanism unlike any we sampled during Apollo? And while we look at this boring area, what is the origin of the fairly massive ridge near the bottom right - the one with two small impact pits? Or the linear downstep south of Wöhler indicated by the shadow-casting line of hills? Something happened in this region that we haven't recognized, yet. Proposal mentioned yesterday submitted successfully today! 19.10.2008 00:24 UT. 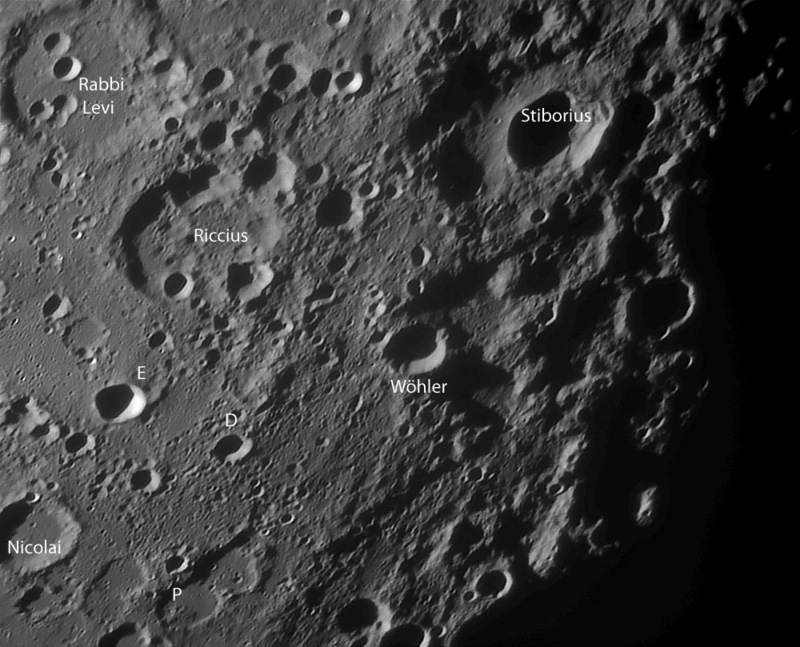 350 mm newtonian + barlow 3x + extender Vac-135 camera, b/w 1280x1024. 245 frames from 2100 in AviStack and Registax. This page was last modified on 14 September 2018, at 01:04.